Moroccan Green Tea with fresh Mint leaves is served all day especially as a drink of hospitality in the Kingdom of Morocco. This tea is traditionally a man's affair, prepared by the head of the family, served to guests, and it is impolite to refuse it. I have tons of mint from my little yard and somehow had to find ways to finish them. My friend suggested making Moroccan Mint Tea while she took home some Mint. After a long spell of warmer days( BTW who says it always rains in Seattle) , we finally had some showers yesterday and it was time for a nice hot Tea~a very refreshing tea for all day long and my entry for Lavi`s IAVW-Moracco conceptualized by Vaishali's Holy Cow . Moroccan Proverb: A wise woman has much to say and yet remains silent. For the basic traditional recipe, you require a tea pot that can be heated on a stove or simply a pot. Bring 4 cups water to boil and add 3 teaspoon green tea leaves (if not available, Indian tea may be substituted) . I used Indian tea leaves. Bring the water to the boil again and then remove from the heat while you place 1/2 cup of pressed fresh mint leaves into the water. Bring to boil again then remove from the heat and let set for a couple of minutes. Pour one tea glass full of tea. Add 3 teaspoons sugar ( Moroccan tea is very sweet so adjust accordingly). And nice to know about the Moroccan food!! I love this tea, when we wer einegypt we used to drink this a lot. And i just love love that picture. This sounds like a nice tea, must smell very nice! That looks very flavourful n refreshing! Girl I like that kettle even more than the tea:-) Very warm picture. Very elegant looking tea and so simple to make. You made my Day Cilantro! I just love the Picture. MINT Tea is much popular in Moracco. Glad you have send it to me. Thanks to your friend who suggested Mint Tea. Wow a lovely, refreshing tea. Your picture looks absolutely brilliant. Nice pic..Loved ur Tea pot..
Woww Gorgeoys click!!! looks awesome! I have loads of mint growing in my yard too, and I love the idea of making this delicious tea. In fact, I'd love nothing more than a tall glass right now. Thanks for sharing the recipe. Love the picture ! refreshing ! Super click, how did u take such an amazing picture?? I absolutely looove mint tea. Awesome shot Cilantro. That pic looks fantastic! I would never have been able to take a picture that creative! Lovely snap! The tea looks so inviting! That picture looks like out of a magazine cover! This is an excellent photograph. Thank you for your lovely comments and the info about the tea pot. I am not an expert in making tea or do I have enough knowledge about tea pots. Alton Brown from food network did a show on tea once and as far as pots, he did recommend the cast iron, because they held heat well (cast iron, porcelain-lined ) with little strainer inside. I went ahead and bought this small cast iron porcelain coated one from World Market based on his advice. this is a really really beautiful snap. excellent job. love the way you've presented the tea. amazing color. 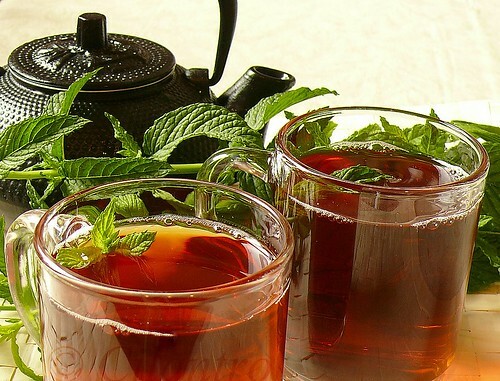 Classic Moroccan Mint Tea is made by steeping green tea with spearmint leaves. Many families serve it more than once a day. Moroccan tea pots vary in size, but a small pot typically holds about a half liter (six glasses) of tea, while a larger pot holds approximately a liter (12 glasses). I noticed that someone has copied your picture. Just thought that you should know. Not sure if they had asked for your consent. Thank you very much Rathai. I did visit the site and found a link to my post and I am glad that credit was given to my picture. Thank you again for mentioning, it means a lot to me.